That's what I am trying to achieve, I did with my old seat until it fell apart, got a new one which was cool and low enough to get centre line but the buttkicker bolts on the gas lift part and now won't go low enough so some tinkering needed. Oh, I'm awfully late for wonderfully heated discussion, but anyways I'm person that likes to draw things out, so here are stuff you have been talking which I'm not sure that were always quite clear between messages. Key thing is if one ignores recommended viewing distances and places wider monitor same distance as narrow monitor or if one takes account recommended viewing distances and places monitors at different distances. For example 200" wide image from 800mm away is quite nice experience, even it is bit too close for cheap projector setup, it is nice. Shame that I don't have such anymore. I made this video only for the purposes of helping others who can't have triples and be able to achieve a little bit more immersive experience. Triples are the way to go in terms of immersion and everything else, no comparison. According to my personal experience, in order to achieve 1:1 (with monitors setup) 3x 27inch wide screens are best for close up, 30 inches or more may have to be pushed a little bit further. My problem is the base of my monitors is rather large so I can't slide them close enough. Basically the middle screen isabout 800mm from my eyes. The FOV calculator says I need to run the FOV at 0.5 but to me it feels like it should be more like 0.3 or something. Unfortunately my gaming PC and desk is also my business computer and work space so I'm limited to what I can do. FOV calculator is typically useful only for your reference or starting point. After that, you will have to do some practical/ physical works and adjustments in order to achieve the best FOV as possible. Some people sit in a real (preferably sports cars) to measure the distance between their eyes and the dash, windscreen, center console, vent grill etc........I did that too and it kinda works. If you decide to have dedicated sim rig one day try this:....... Cut a piece of a cardboard box or any other material that matches the size as your monitor screen. Sit in a real car (sports car if possible) and place this fake screen behind the steering wheel closer to the dash. By doing this, you will get a better idea/ better picture. I'd suggest 27inch widescreen for this application, no more and no less. For your information, the distance between my sim steering wheel and the monitor is approx 18cm. The distance between my eyes and the computer screen varies between 60cm-75cm depending on the recline level. Monitor size and position is always a compromise if you don't have a purpose built rig. I built my own in the garage and have a 32inch screen at 670mm from my eyes and do get a 1:1 at the expense of pheripehal vision (single screen). From memory the smallest you can realistically go and still get true scale is 27inch screens at 600mm. It's very difficult to bring a screen closer than that as the wheel gets in the way. If it's any consolation I had to put my sim gear into storage for 5 years until we bought the new house and I could have a deducated space for my rig. A compromise is better than no racing at all..... I hope VR continues to improve over the next few years and it will become the go to solution. I just can't deal with the poor resolution and lack of shadows etc at the moment. There's me thinking it was all down to the distance your wheel is from your monitors. Tiz the single most important thing to get absolutely right, in my head (don't go there) I set my triples up in Sim H x W x etc (Steam launch option) then, when I'm happy all is working, I then sort my FOV out and this I find is more linked to the wheel from screen distance, more than eye from screen distance, If the wheel is in the right place, compared to dash, then I adjust the seat. Tried every other way and every calculator out there, yet this seems to be the only way I can get something that resembles driving a car. I do start with a FOV of 0.6 in Sim and 99% of the time that's where it stays. Might be an idea for a Dev to add his/her tuppence worth. If you watch @Georg Ortner streaming, more so his earlier streams, it was very difficult to believe he was not actually driving a real car, single screen but right up against the wheel base. At the end of the day the lump of meat between most of our ears is a capable beast and can cope with just about anything we throw at it, with regards to FOV, so do whatever you prefer to do, just don't tell anyone as you may upset someone. But remember that if you want to step from virtual to real driving then getting the FOV perfect is essential and for people new to Sim racing but already drive irl, why make life harder for yourself, get it right from the start and you can concentrate on actually driving! It's nothing to do with where the wheel is. It's nice to fiddle with the seat so that they line up but that's just aesthetics. Adjusting FOV affects the world outside the car, the in car view is just displayed on top of it and has no bearing on perceived distances etc. Bottom line is if you're not setting it up via eye/screen distance then you're doing it wrong. yup I just got a tape measure out and measure my eye to screen and noticed that what I thought was 700 was actually 780 so I punched that into the launch options and it was much better. One thing that I did notice that the tri screen options you can bind in the controller setup menu effectively adjust the eye height parameter and the distance to screen parameter of the the launch options. I was wondering how the ingame FOV adjustment differed from the tri screen FOV adjustment and from what I can tell the ingame only effects the track whilst the tri screen distance fov effects both the car and track. It maybe just aesthetics but it makes it all feel more real and immersive. For me if my physical wheel looks too far away from the virtual dash it feels like the car is rotating on a weird axis (not sure how else to explain it) so I certainly have to move that seat right forward to get it feeling right. This means that in most sedan cars I can't see the passenger side mirror in my triples but it all feels better. The strange thing tho is if I have the virtual wheel turned on it is a LOT bigger then my actual wheel so I'm not sure why that is! Oh totally, adjusting the seat position is crucial for immersion, it makes the difference between feeling like you are sitting in the car or not. Because I'm on a large single it means I can see the dash display. As well as the almost the full height of the windscreen. With the steering wheel display I think it's because of perspective, on a 2d screen it's trying to show a wheel that is obviously closer to the driver than the dash is. Also in game wheels vary in sixe where as your physical wheel doesn't. I always have the in game wheel off. Get FOV sorted from measurements and never change it, that keeps the world correct. Then tweak seat position slightly until it feels like you're sat in the right place. I have big problems driving single seaters as my rig is set up for GTs in terms of pedal position etc. When I position the seat correct for single seaters it feels like my legs are sticking out of the bottom of the car! God knows what it would be like with VR! Also regarding seat forward and back....remember in most modern racecars the seat is position way back, behind the b pillar usually. It's a very different view to in a road car. The dash should seem quite far away. Is there really a "correct" FOV? It seems like people are treating a 2d space like a 3d one. 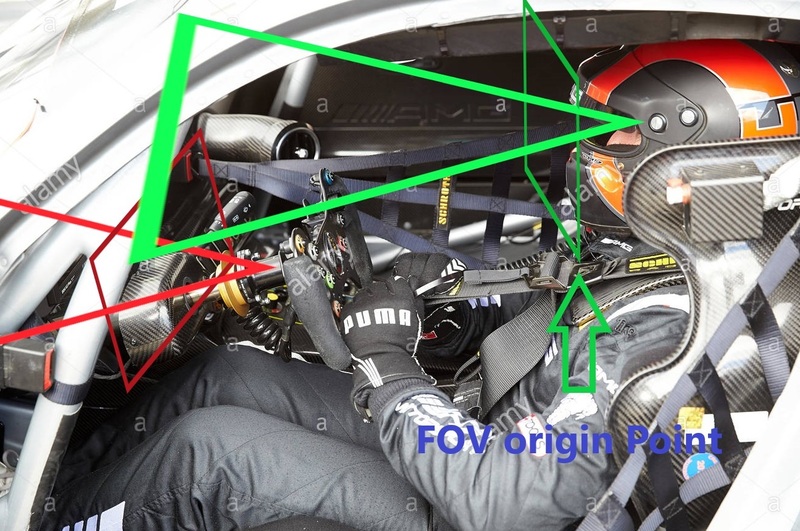 The origin point camera is the driver eye point (green) and these videos seem to treat the surface of the monitor as the beginning of the dashboard (red) so that their real wheel matches up and whilst it looks like cool immersive you will see that the in game wheel and the driver arms are ginormous if you keep them on, so big that they block the view. This is a 2d space and trying to match it to a 3d object( your real wheel) whilst immersive isnt necessarily correct. VR headsets dont have such low fov and that if anything is a close to reality in a 2d space as you can get. I dont think there needs to be a "real FOV or youre doing it wrong" as its all personal preference. The fastest driver in our race club doesn't use a "real FOV" at all. He is really fast and his symbiosis with his equipment is amazing depite haveing default/high FOV but according to these guide videos you will be a better driver if you have super low fov so that you can brake better etc etc. My point is that its just down to preference especially when it comes to using just one screen. 0.5-0.7 is in my opinion just to damn zoomed in for one screen. Yeah I Know what you mean. Because I'm using effectively an office chair I sometimes think I can do a Fred Flintstone and paddle my feet on the ground to get some extra speed LOL. I feel I need to get my peddles higher and lean back in my chair more ....again it comes back to compromise. All this never ever bothered me much but since I've got my Fanatec gear and spent time setting up my triples I'm noticing all this stuff and it's hard to not let it spoil the immersion. I dont know what's going on with the red bits but correct FOV means you treat the screen as a window. At 1:1 whatever you see through that window is what you get. For most people even on triples that means that you would see little to no dash, which is fime, as there is no point looking at dashboard anyway. Not everyone likes that though and fudge it by either running higher FOV that they should or altering the seat position to an unnatural value. While technically, there is correct FOV and all things equal it should be fast, since it's as accurate a representation of what we see in real life as possible on screens. As you say personal preference does play a part. If someone is happy with their setup then so be it, SIM racing is a process of learning to process what we see, hear and feel. Lots of fast drivers run very weird physical setups. While it's being discussed though we may as well talk about what is correct, and work from there. I had to gradually come down to 0.5 as at first it felt totally wrong (to used to higher FOV) but now I wouldn't go back. The fastest driver in our race club doesn't use a "real FOV" at all. You are right, a real FOV won't make you faster. It is only for better immersion and enjoyable experience. Some cars have seating position higher or lower. Not sure if this is upto drivers specifications or just the way that the car is designed? yeah I never drive with the wheel turned on...I can't stand games that don't allow you to completely turn the wheel off.